MS Bag Filter Housings and Filter Bags are used by industries around the world and are manufactured worldwide to global standards. Customers can choose from a complete line of single and multi-bag filter housings designed to meet the needs of the most demanding applications. The choice of single bag filter housings range from those suitable for exacting absolute filtration applications to high quality housings designed especially for cost sensitive applications...and everything in between. Multi-bag housings that accommodate up to 24 individual filter bags for flow rates of up to 4400gpm are available in a number of different designs. 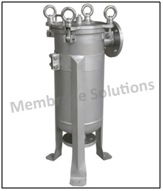 MS side inlet bag filter vessel to meet your cost budget requirement in filtration equipment selection, yet providing a good sealing mechanism, strongly recommend for water filtration process.